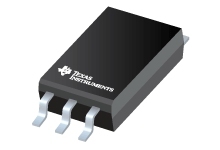 The UCC23513 is an Opto compatible, single-channel,isolated IGBT, SiC, and MOSFET gate driver with 3-A peak output current and5KVRMS reinforced isolation rating. The high supply voltage range of 33 Vallows the use of bipolar supplies to effectively drive SiC power FETs. UCC23513 can drive bothhigh side (with external boot strap diode and capacitor) and low side power FETs. Key features andcharacteristics bring significant performance and reliability upgrades over standard opto-couplerbased gate drivers while maintaining pin-to-pin compatibility in both schematic and layout design.Performance highlights include high common mode transient immunity (CMTI), low propagation delay,and small pulse width distortion. Tight process control means small part-to-part skew. The inputstage is an emulated diode (ediode) which means long term reliability and excellent agingcharacteristics over traditional LEDs. In addition, the Material Group I mold compound andresulting comparative tracking index (CTI) of >600 V means robust insulating material.UCC23513’s high performance and reliability along with its stretched SO-6 package, > 8.5-mmclearance and creepage makes it suitable for inverter applications in motor drive and solar, DCmotor control, industrial power supplies, and appliances. The higher operating temperature opens upopportunities for applications not previously able to be supported by traditionaloptocouplers. © Copyright 1995-2018 Texas Instruments Incorporated.版权所有.